A healthier version of the Costco treat! 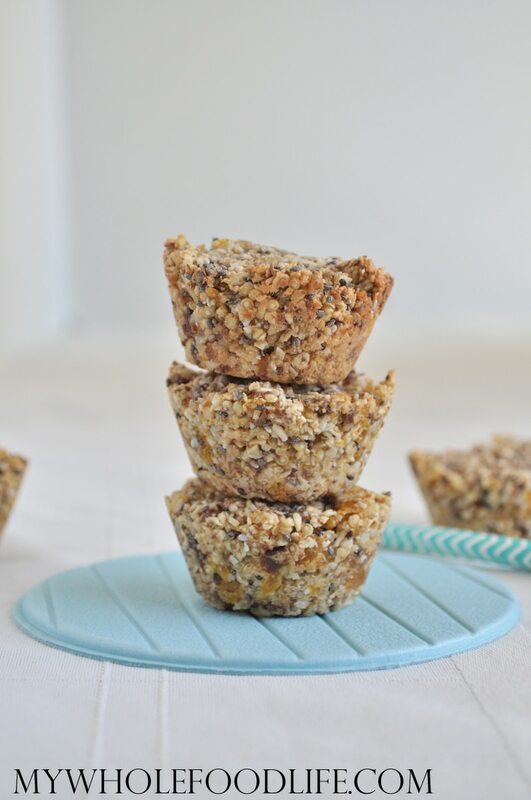 In a food processor , combine the oats, quinoa, coconut, sunflower seeds, flax meal and chia seeds. Then add the maple syrup and continue to blend. Lastly, add the apricots and raisins and blend some more. Grease or line mini muffin pans . Spoon a little mixture into each cup. Press down the mixture well with your fingers. These should last a couple weeks in the fridge and much longer in the freezer. I made them yesterday and while the taste was good, they are stuck to the muffin liners. And when I tried to remove them, some of the paper still remains stuff to them. Any solution to that. And thank you so much for sharing such a wonderful healthy recipe. Sorry they stuck for you. :( Oil free recipes do tend to stick to paper liners, so it's always a good idea to spray the liners with a little oil. I use silicone liners and they did not stick. Greasing my muffin pans with coconut oil works great for me. Thanks Melissa. Do you adding a little bit coconut oil will make them a softer. Mine were not hard but a little harder than Costco. I think they are soft because of butter and oil which is so many more calories. But I was thinking of adding just a little oil to see if that made a difference. What do you suggest. Adding coconut oil would definitely make them crispier. My husband and I just made our first batch of these and they are really, really good! I think they may be even better than the ones from Costco. Thank you for sharing this recipe! Yay! So happy to hear you like them! Do you measure the 1/2 cup quinoa before or after its cooked? After it's cooked. Since quinoa usually doubles in size, you can cook 1/4 cup to get 1/2 cup cooked. I am totally going to try these. I sure love the Cosco Aussie ones. I ran out of flax meal, can I leave it out? WONDERFUL!!!! I used dried cranberries in place of raisins as I did not have them. Also used cashews instead of sunflower seeds. This recipe will stay in my house forever!! Good for holidays too and all those folks that have special dietary concerns. Very healthy! THANKS! So glad you liked them Sieka! These are terrific! finally found a healthy dessert we can all enjoy! I did not have apricots so i used frozen cherries instead. I will definitely be making them again. Thank you for the great recipe! You are so welcome Leah! Glad you liked them. I made these again today. Subbed coconut nectar for maple syrup, Gogi berries for raisins and added a little coconut oil for moisture. I also used someone else’s suggestion and formed them into 12 patties. Waiting for them to cool. But the smell delicious. Can these be stored at room temp? Don’t want them crumbling if I send them in lunch bags. I haven't tried to store them at room temp. If the lunch bags have an ice pack in them, they should be okay.